Xylamax® is a unique xylanase enzyme feed additive scientifically developed by BRI scientists for consistent, premium performance. An endo-1,4-beta-xylanase, Xylamax improves animal nutrition and gut health by breaking down non-starch polysaccharides (specifically xylans) in cell walls of feed grains so that valuable entrapped nutrients can be released for digestion. Xylamax out-performs other xylanases by releasing up to 130 kcal ME/kg in corn-based poultry diets and up to 150 kcal ME/kg in wheat poultry diets due to its unique protein structure and pH profile. Xylamax is a GH11 xylanase that hydrolyzes both soluble and insoluble xylans, maximizing release of nutrients from many types of feed grains. 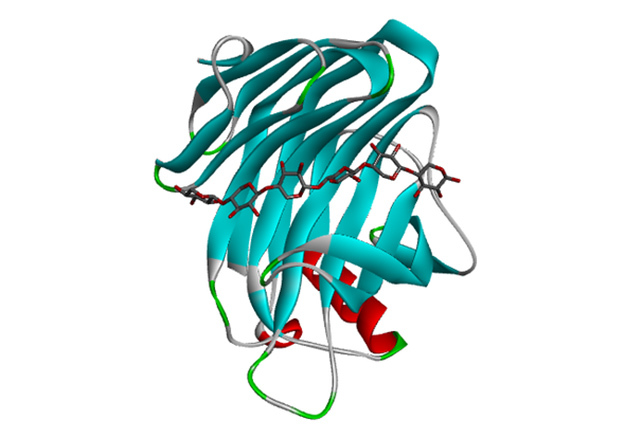 It has an extended enzymatic site which allows greater catalytic activity than other GH11 xylanases. Xylamax further accelerates digestion by reducing digesta viscosity and improving passage rate. 3D structure of Xylamax enzyme depicted in ribbon form with a xylan molecule bound in the enzymes active site. By reducing the amount of undigested xylans in feed, Xylamax limits the growth of pathogens in the intestine. Birds supplemented with Xylamax exhibit significant less severe necrotic lesions, increased villi height (improved morphology), and significant reduced mucosal MDA (an indicator of oxidative stress). Xylamax has also been shown to create a prebiotic effect by improving nutrient digestibility, maintaining healthy micro-biota and providing increased protection against pathogenic challenges. Xylamax can be used successfully across multiple feed ingredients and production environments using a Reformulation or On-top Feed Strategy. Animal trials have shown that Xylamax consistently improves FCR by 4 to 6 points. Field research confirms that Xylamax creates statistically significant improvement in average bird finished weight and flock uniformity. Xylamax is intrinsically thermostable at pelleting temperatures of at least 85 degrees Celcius.